Game of Thrones season 7 episode 4 has leaked online and available on several sites for watching. It includes direct links on Reddit and many torrent website. The leaks are reportedly connected to the recent HBO hack in which hackers stole around 1.5 TB of data. GoT s7e4 was scheduled to release on August 6 in the US and August 7 in India. The hack of HBO’s servers, earlier this week, leaked Game of Thrones s7 plot/script outlines only. The ep4 leak shows two watermarks – a ‘Star India’ one in the bottom right, and a ‘for internal viewing only’ one in the top left corner. According to various reports, the leaked episode is a low-quality video but genuine. It is available on multiple websites and via Reddit forums. 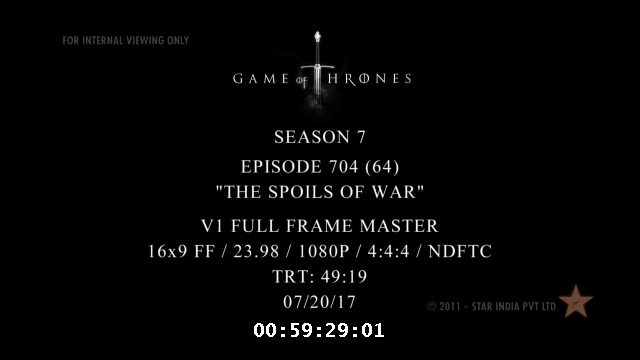 It carries July 20 date in the opening card which indicates that it was ready in the first week of GoT S7 release itself. It may be for production level. It may be possible that the final cut could be different. Check: Jab Harry Met Sejal collection. The HBO hack unfolded at the start of the week, allegedly, leaked unaired episodes of HBO series – Insecure and Ballers along with the script of GoT. The leaked promised more of the same. The leaking of ‘to be aired’ GoT episode seems to be the follow up on the same threat. Maybe Star India servers also got hacked? GoT has been one of the most pirated series of all times. The first three episodes of season 5 got leaked online prior to the s5 premiere in 2015. It happened when screeners sent DVDs to the press. Since then, HBO has stopped this practice. Officially, Game of Thrones season 7 episode 4 is going to air on August 6, 2017, at 9 pm ET on HBO, August 7 on Hotstar, and August 8 on Star World in India. Let’s know your thoughts, views, and predictions about the series. Stay tuned to TheReporterTimes for latest GoT news and other series updates around the world.